This is my idea of the perfect Chocolate Ice Cream. It has a rich chocolate flavor with a silky smooth texture that makes you think you are eating a frozen chocolate mousse. Serve this decadent ice cream in pretty bowls, or maybe you would prefer to place a scoop, or two, in your favorite ice cream cone. 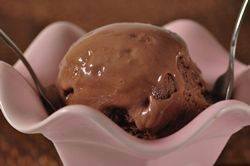 This Chocolate Ice Cream recipe starts with a cooked chocolate custard, made from a mixture of cocoa powder, semi sweet chocolate, half-and-half cream, sugar, egg yolks, and vanilla. Now, each ingredient contributes to the ice cream's rich flavor and silky smooth texture. The rich chocolate flavor comes from adding both unsweetened cocoa powder (you can use regular unsweetened or Dutch-processed) and semi sweet (or bittersweet) chocolate. The half-and-half cream (you can use 1 cup (240 ml) cream and 1 cup (240 ml) milk) contributes to the ice cream's rich and creamy flavor and, of course, the sugar provides the sweetness. The egg yolks are necessary for its rich smoothness. I like to make the custard the night before and let it chill in the refrigerator overnight, so it is nice and cold before it is churned. It also allows time for all the flavors to soften and mingle. It is important that the custard only fills your ice cream machine about half to two thirds full. This gives the custard enough room to expand while it freezes so you end up with an ice cream with a light texture and no graininess. Depending on your machine you may find the ice cream is still quite soft once it is churned. You can serve it immediately if you like a "soft serve" type of ice cream. But if you prefer it a little firmer, transfer to a storage container and place in the freezer for a few hours before serving. Although I prefer to eat homemade ice cream the day it is made, it can be stored for a few weeks in the freezer. It may become quite hard after being frozen for any length of time, so I find it best to transfer the ice cream to the refrigerator to soften for about 30 minutes before serving. In a separate bowl, beat the egg yolks and sugar until light and fluffy (1-2 minutes). (You can do this with a wire whisk or with a hand mixer.) Set aside while you heat the cream. In a small saucepan gradually whisk the half and half cream into the sifted cocoa powder until you have a smooth paste. Place over medium-high heat and, stirring often, bring to the scalding point (the milk just begins to foam up). Remove from heat and gradually pour the scalding half-and-half mixture into the whipped egg yolk mixture, making sure you keep whisking constantly so the egg yolks don't curdle. If any lumps do form, strain the mixture. Then stir in the melted chocolate. Immediately remove the custard from the heat and continue to stir the custard for a few minutes so it does not overcook. At this point stir in the vanilla extract. Cover and let cool to room temperature and then refrigerate the custard until it is completely cold (several hours or preferably overnight). Transfer the cold custard to the container of your ice cream machine and process according to the manufacturer's instructions. Once made, transfer the ice cream to a chilled container and store in the freezer. If the ice cream becomes too hard, place in the refrigerator to soften for about 30 minutes before serving. Note: Instead of vanilla extract you can use 1/2 vanilla bean. If using, add the vanilla bean to the cream and cocoa powder mixture and bring to a boil.